Karbonn Mobiles have introduced another budget tablet in the market – Karbonn Smart Tab 2. The latest Karbonn tablet runs on Android 4.0.3 Ice Cream Sandwich operating system and is upgradable to the latest Android 4.1 Jelly Bean. The Karbonn Smart Tab 2 is available for purchase via online retailer Snapdeal for Rs. 6,990. The Karbonn Smart Tab 2 has a seven-inch capacitive touch display with a resolution of 800 x 480 pixels. The device is powered by a 1.2GHz processor. It has 2MP front facing camera, 4GB of internal storage, microSD card slot that supports storage up to 32GB, and a 3,700 mAh battery, which is rated to deliver up to 25 hours of music playing time and video playback time of up to 8 hours. For connectivity , the device supports Bluetooth and Wi-Fi. 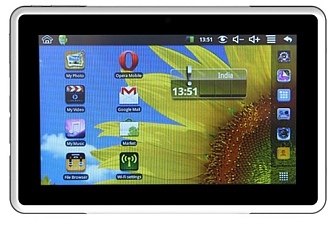 The Karbonn Smart Tab 2 launch comes days after the company announced the Android 4.1 Jelly Bean-based Smart Tab 1. Karbonn has said it will be rolling out Android 4.1 Jelly Bean update for the existing customers of the Smart Tab 1 as well.